You are here: Home / UCLA Symposium: Exploring Practical Ways to Inspire and Reward Teaching Effectiveness and Instructional Innovation / Judith Lengyel Memorial Lectureship: Emily Miller, Ph.D.
Bio: Emily Miller has served at AAU since November 2012. As the Associate Vice President for Policy, she has primary responsibilities for collaborating with member campuses on institutional policy efforts related to undergraduate and graduate education. She directs the AAU Undergraduate STEM Education Initiative, the PhD education initiative, and other grant-funded projects. She also staffs AAU’s STEM Network and Association of Graduate Schools constituent groups and serves as liaison to the AAU Arts & Science Deans group. 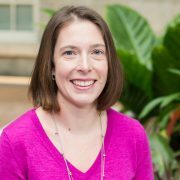 Previously, Emily was a research and curriculum specialist for the Association for Community College Trustees, an assistant director of career services at Tufts University, worked in alumni relations at Harvard Business School, and collaborated with the Association of Governing Boards. Emily has published on the topics of post-secondary institutional leadership, specifically as it relates to governance and administration; organizational change in universities and colleges; and higher education policy. Emily earned her PhD in Higher, Adult, and Lifelong Education from Michigan State University; MA in Education Policy and Management from Harvard Graduate School of Education; and BA in Political Science from Gettysburg College. Abstract: Efforts to improve undergraduate teaching and learning are linked to the policies and practices of faculty evaluation. In recognition of this lever for change, departments, colleges and institutions are implementing and piloting innovative efforts to more effectively evaluate teaching. In this interactive talk, we will explore the various strategies AAU universities are using to create an environment where the continuous improvement of teaching is valued, assessed, and rewarded at various stages of a faculty member’s career as well as situate this work in the broader national context.